"Designed for children ages 3 and up, it comes with everything they need to make 16 different projects." "Designed for ages 8 and up, it comes with everything little girls need to create 12 2-inch tiles including the magnets, paint, and a paintbrush." "Perfect for tweens and teens, this craft kit helps them make a super cool and inspiring piece of wall art." The 80-piece kit has everything needed to make six necklaces...Recommended for ages 7 and up." "While girls are making the yummy-scented bath bombs, they’re also learning about the chemical reactions that make for the fizzy fun." "The kit comes with pre-cut squares in six bright colors that children can tie together in various patterns...Recommended for ages 3 and up." "Create 18 adorable little food-themed plushies including a donut, bacon, a cupcake, and more." "One kit contains enough materials to make four flower crowns adorned with paper roses, glitter, garland, and more...Recommended for ages 7 to 15." For the smallest crafters, this box of craft projects from Alex Discovery provides options aplenty for creative crafts. Designed for children ages 3 and up, it comes with everything they need to make 16 different projects, including buttons, feathers, glue, crayons, doilies, and more. Project options include farm animal collages, tissue art, and paper bag puppets. It’s a great activity to bring out for playdates or on those days when it’s too hot, rainy, or cold to go outside. Parents say kids love this kit and that it provides hours of entertainment. The say the quality of the materials is goo, and they like that the supplies for each craft are bagged separately, which helps keep things organized. This craft kit lets girls express themselves on magnetic tiles, which they can then display on their lockers, on the refrigerator, or on any other metal surface. From unicorns to hearts, they can create images and put them on display. 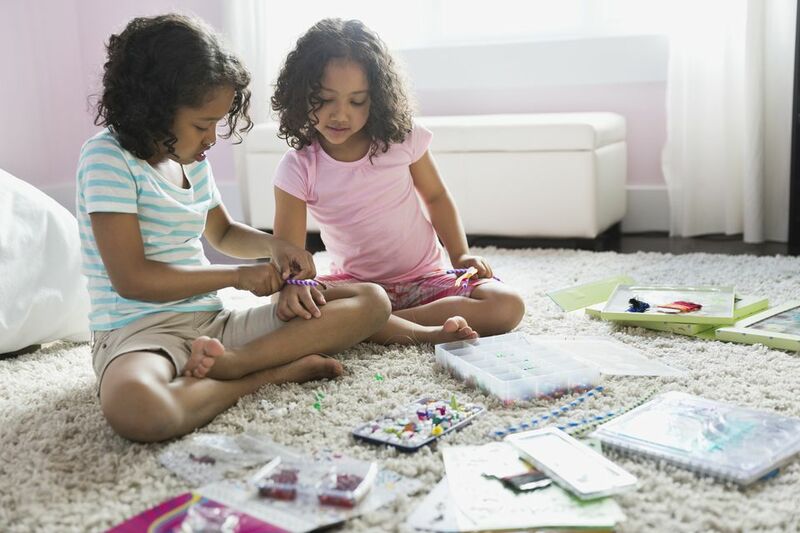 Designed for ages 8 and up (the magnets can be a choking hazard for younger kids), it comes with everything little girls need to create 12 2-inch square tiles including the magnets, paint, and a paintbrush. Customers say girls love this tile art kit, and that the final projects make great gifts for girls to give to their friends and families. They also like that the paint easily wipes off of the tiles before it dries, so mistakes can easily be corrected. Perfect for tweens and teens, this craft kit helps them make a super cool and inspiring piece of wall art. It comes with all sorts of items they can use to decorate the 22 small boxes, including feathers, hearts, pom poms, card stock, and more. The real stars of the project, however, are the pre-printed, inspirational quotes crafters can arrange, including those such as “Collect moments, not things,” "Rise by lifting others,” “Dream big,” and more meaningful messages. Once complete, they can hang it on their walls to remind themselves of these important ideas daily. While some customers report problems with the boxes sticking and say there’s a need for additional glue or tape to keep it together, overall they say it’s a great project that girls love. For floaty, fashionable fun, girls can create these sweet butterfly necklaces. The 80-piece kit has everything needed to make six necklaces that can be as sparkly, simple, or swanky as they like. There are dangling charms, rhinestones, glue and more. Girls can make multiple necklaces to match their various outfits and occasions or give them to others as friendship tokens. The kit also makes a fun activity for playdates and sleepovers, with everyone getting a fun, wearable takeaway. Recommended for ages 7 and up, parents say this craft kit is a cute, fun option. While some have reported problems with the clasps and say the necklaces aren’t made for long-term wear, overall parents say girls have a blast making them and the kit is worth the price. Creativity meets science for an explosion of fun in this bath-bomb making kit. While girls are making the yummy-scented bath bombs, they’re also learning about the chemical reactions that make for the fizzy fun. There are multiple recipe options for them to experiment with too, as they change up the colors, scents, sizes, and more. The kit includes everything girls need including beakers, fragrance, and coloring. For safety, there are gloves and goggles in there too, as well as instructions. It’s recommended for ages 8 and up, and according to customers, this kit is the bomb. They say the instructions are simple to follow and that girls love this cool craft. For a pop of color on your couch or a bed, there’s this great kit that lets girls make a cozy quilt. There’s no sewing or cutting required; it all comes together with simple knots. The kit comes with pre-cut squares in six bright colors that children can tie together in various patterns. When they finish, they’ll have a soft, cozy quilt that measure 3.5 x 4.5 feet. Recommended for ages 3 and up, it’s a simple yet satisfying craft and makes for a fun gift for grandparents or other relatives. Parents say it’s a fun way to keep kids occupied, and that it’s easy enough they can make the blanket entirely on their own. This craft kit from Klutz is so awesome for girls who want to start working on their stitches. Even if they’ve never sewed before, they can use this kit to create 18 adorable little food-themed plushies including a donut, bacon, a cupcake, and more. It comes with all the felt, floss, needles, stuffing, patterns, and other pieces they need, as well as step-by-step instructions to create each plushie. Parents say younger children may need help, but once they get the hang of it, they can do it by themselves. Reviewers say the instructions are nice and easy to follow and that the finished stuffed characters are adorable. When the girls are all gathered for a sleepover, sleep is usually the last thing on their minds. Having a cute craft on hand is a great way for them to have some creative fun and these flower crowns are sure to be a hit. One kit contains enough materials to make four flower crowns adorned with paper roses, glitter, garland, and more. Their creativity will drive the designs and they’ll love sporting their unique creations. Recommended for ages 7 to 15, the crowns can be adjusted in size to fit everyone from toddlers to adults. Parents say the quality of the materials is good and girls love making them. The finished products make for some adorable party pictures too. What's a Fun Art Activity for Pre-Schoolers?